I literally stumbled upon a family greeting/meeting during my evening walk a couple of days ago. I had been photographing a 1 to 2 year old female who was mozeying along a trail, minding her own business, pouncing for gophers of which she caught several which she wolfed down, and then she diverted into a pathless forested area. I remained on the path but peeked over a hedge in her direction, only to find an adult who may have been Mom (or possibly a babysitter yearling), and a pup — pups here in San Francisco are about 6 weeks old now — who had emerged to greet the approaching yearling female. The female approaching did so in a crouched position, which messaged a non-threatening subordinate status. I took a couple of quick photos (which revealed the pup to be a male), and immediately began retracing my steps out of the area. These coyotes withdrew into the bushes due to my presence in order not to reveal any of their additional *secrets*. As I was distancing myself, Dad appeared, and he wasn’t too happy about what he knew to be the discovery of his family’s hiding place. Dads spend much of their time protecting their den areas and scaring off trespassers. They hope that their mere presence will serve as a deterrent, and indeed, that should be enough. I continued distancing myself, keeping my eye on Dad. Dad messaged me his concern with a few grunts, in addition to his presence, as he watched me leave. The gophers caught by the yearling might have been for the pup. Yearlings are older siblings to the new pups — they are from the previous, and even previous to that, year’s litter, so they are either one or two years old. They are the “aunties” and help provide for the new litter. Only one or two yearlings, if any, normally stick around like this, the rest of the youngsters from those previous litters “disperse” out of the area to make their own way in the world. A number of San Francisco’s dispersed youngsters last year were tracked as far south as Los Gatos — that’s 60 miles south — all of these were eventually killed by cars. Cars are the primary killers of dispersing coyotes: these coyotes are young and have had very little experience with the extreme dangers of automobiles. The Golden Standard, and the safest and most effective option, especially when walking your dog, is simple and complete avoidance. Whether you see a coyote in the distance, at mid-distance, approaching you, or if you are surprised by the sudden appearance of one at close-range, shorten your leash and walk away from it to minimize any potential dog/coyote confrontation or engagement — and continue walking away. IF you make a personal decision to shoo it away, please follow the guidelines in the video, How to Shoo Off A Coyote”, but know that this is engagement. What’s safest is simple and complete avoidance. Coyotes are territorial. Coyotes are possessive. This is no different from you in your home: you don’t allow outsiders to come wandering through, and if you see someone suspicious in the neighborhood you may follow that someone to make sure he/she leaves. This is what coyotes do in the only effective way they can: they repulse with their scary “Halloween cat like stance”, they may follow an intruder out of their area, or or they may nip the haunches of the dog they want to move on and away. They want you to leave, so why not do it?! 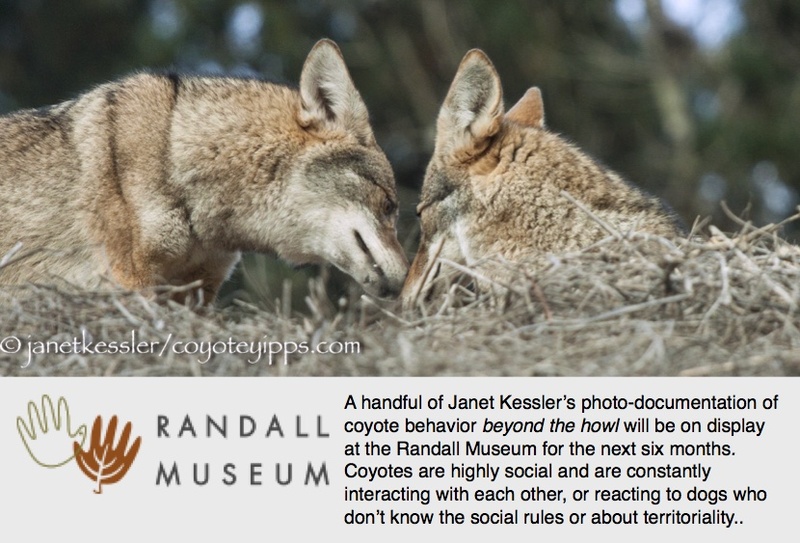 For more information, see How To Handle A Coyote Encounter: A Primer. This is how pint-size coyote pups look right now, mid-May, at 4 to 6 weeks of age. Chuck Rossi was going to be posting his videos of coyotes growing up and we were all excited about it. However, this, below, was the only video posted on April 30th because then Chuck noticed that the mom hadn’t returned for a few days. Mom coyotes frequently leave their pups for a full day, or even for several days, leaving them with enough food in the den to keep them going. The rescue group Chuck contacted decided to retrieve the youngsters, and it may have been a good idea since a coyote was found killed on the side of the Alameda Expressway about 1/2 mile away — they are assuming this was the mom. I see Dads hanging out not far from their dens these days — that’s their job right now: they are on sentry duty to protect the dens and pups. Where was Dad in the case of this den? Dads fully contribute to raising the youngsters, but these youngsters were still lactating — could Dad have filled in here? The question is a moot one since the pups are now under the care of a rehabilitator. No one can prepare baby wild animals for life as well as their parents can. If you suspect you’ve found *abandoned* coyote pups, stand back and watch for a few days before *saving* them. Maybe they need saving, but maybe they don’t! See: Please Don’t Rescue Abandoned Coyote Pups! I found your wonderful blog and fabulous photos as i was researching coyotes on the google machine. I really like your respectful approach to wildlife. Thank you for sharing your photos and observations. I started learning about coyotes this spring, when i found a coyote den on my property. I live in Portland Oregon, on the outskirts of the city. I found a large hole in my yard about a month ago, and as i was sitting near the hole trying to decipher the tracks in the mud around it to figure who might live in there, i heard some high whimpering coming from the hole (pups!). After an entire day of watching the hole from a window i finally saw that a coyote mother crawled in there after cautious observation to make sure nobody was watching. I have not told anyone about this den for fear that someone in my neighborhood would call animal control and ‘remove’ the animals. People have so much fear and disdain towards coyotes. I have mixed feelings about this den. On the one hand, i am honored that they would find my yard safe to inhabit. On the other hand, i have cats who go outdoors during the day (but i keep them indoors at night). If it weren’t for the cats, i would have absolutely no problem with this den here. I am not sure how to proceed. These cats harass me all day long to go outside. I find it unfair to trap cats indoors who are habituated to going outside (what good is prison life?). What is the likelihood of coyotes hunting cats during daytime? There are conflicting opinions on the internet. I get the sense the coyote mom may have moved her pups this week- I haven’t seen her at all in the yard. She knew i knew where the den was. I spend a lot of time in my garden and that probably made her nervous. Do you know if coyotes return to their dens after a period? I want to coexist peacefully with this family of coyotes. I found your blog to be a great resource for understanding coyote behavior. I have so much more to learn. I want to understand them so that i can avoid conflicts and allow these beautiful creatures to live peacefully. If you have any advice or resources you could point me to, I would be so grateful. Thanks again for everything you have shared in your blog. I’m so glad that you like the blog and that you like my approach to wildlife! Thank you! Cats could be a problem for coyotes (and vice versa) for a number of reasons. Yes, ultimately, some coyotes do see cats as prey. But also, cats and coyotes are competitors for the same resources (rodents), which, if resources are low, could cause conflict between the cats and the coyotes. A half-way solution which would allow the den to remain undisturbed and your cats to have *some* freedom would be a catio. Of course, a catio isn’t really the out-of-doors, so it may not be a solution that would work for you. Coyotes do move their pups between several dens during the pupping season. Creating a slight disturbance everyday — as apparently you have — will cause the coyotes to move to another location. If your coyote mom moved the pups for this reason, she may not return. If she moved them simply because it was time to rotate them to another den site, then she could come back. If you don’t want them back, continue to create a disturbance around the den — or put some soiled human socks close by and walk around the den opening a few times for several days in a row to leave your scent. If you want them back, you might stop the gardening for a while (no guarantee they’ll return). As you say, people have a lot of fear and disdain towards coyotes, so we need to keep in mind that the coyote could move her pups to a place where they are absolutely not welcome. This is the biggest problem to be aware of. In addition to my coyoteyipps blog, there is a website I contribute to a website called Coyotecoexistence.com. These two sites will answer a lot of your questions. THEN, if you are lucky enough to have the family return, spend time watching them! This is how you are really going to learn about them. I would be really happy to post any of your observations and photos. Your story is very interesting! Let me know, and also please let me know if you have further questions! Thanks so much for your quick reply and helpful suggestions! The Coyotecoexistence website had some really helpful videos (i had found that before, and didn’t realize it was related). The ethics of hosting domesticated pets is challenging, and continues to be a source of daily conversation and questioning in our household, with no clear answers on many of the nuances (i.e. pet food, cats hunting critters, prisoners of the house, and on and on…) An unintended positive effect of the coyote den has been that it put one cat on high alert and very cautious behavior outside, so she did not have a chance to hunt anything. The yard became the hunting grounds of the coyote mom from the cat’s perspective. One of the clues that the mom is gone is that the cat acts more brazen now in the ‘enemy territory’ part of the yard. The other cat is ‘sweet and dumb’, and i doubt she knew anything about the coyote’s threat. I watched her stick her head in the den out of curiosity at a time when i knew there were pups in there. Not the brightest crayon in the box. I like the catio idea, and will see if it’s feasible in some part of the yard (although it doesn’t solve my prisoner issue). I attached some photos. The den is dug under an old abandoned ‘root cellar’ type concrete outbuilding that is built into the hillside. You’ll see it’s visible from my bedroom window, so it’s really close to the house. They must have decided we pose no threat to their offspring. The den has two holes that i know of – a main entrance (which i deemed too small for a coyote before I actually saw one squeeze herself in there) and a smaller hole that is definitely too small for an adult coyote. I included the mug in the pictures for size reference. Youngsters are approaching 10 months of age here in San Francisco. Above is a photo of one of them. They are still slightly smaller than adult coyotes, but seen alone, most folks would not be able to tell the difference. If you are lucky enough to observe them in action, you will find that their behavior gives away their young age: they are more flighty, erratic, awkward, zippy and distrustful than older coyotes. They are curious but most likely will observe folks and dogs from behind a bush and at a substantial distance, as seen in this photo to the right. Coyotes tend to play with their siblings, unless it is an “only child” — I’ve observed several one-pup families in San Francisco — in which case they play with a parent. Play is their main interest and occupation, and when they are together, they are constantly and joyfully playing roly-poly, pell-mell, tumble-bumble wrestle, chase and tug-of-war. Youngsters are also good at entertaining themselves. I’ve seen individual youngsters play with an abandoned tennis ball for over 20 minutes, bounce themselves down a hill repeatedly, chase their tail — no different from your own pet. They can also be seen practicing their hunting skills alone, though with substantially less aplomb than an adult. Even if you don’t see a parent around, a parent is very likely to be close by keeping an eye on things, just in case a dog might try chasing. A parent will run in to its pups’ rescue if it feels the youngsters are being at all threatened. Youngsters normally take cues for their own behavior from the parent who is nearby. In San Francisco, coyote dens were abandoned by their occupants long ago — dens are used for birthing and for the first months afterwards before the pups move around much. After that, although coyotes return to the denning area, they sleep out in the open and in various locations. Here are two dens, no longer being used, which I saw on the same outing. This first one shows an opening which has closed up a bit with debris due to non-usage. It’s a hole dug into the root system of a fallen tree. When it fell, the tree was sawed into pieces and left there. The upended tree left openings through the partly buried root system in the ground which the coyote then dug even further for its use as a den. The landscape it is found in is a small redwood grove, as seen above. The second den, below, is one which was entirely dug out by animals. It is located in a scrub area which faces a protective forest. It may have been originally built and used by another burrowing animal. When the coyotes found it, they expanded it for their own usage. This den, as opposed to the one above, has an opening that has caved-in and opened up. The opening probably had some kind of foliage hiding it when it was in use. It opens to the top and side of a hill and goes way back, with a ceiling which is about a foot under ground level. We could have found out more about it by destroying the den, but our aim is always to interfere as minimally as possible: hopefully a family will be occupying it next spring! Every den is different. In urban areas, coyotes have been known to build their dens near buildings, under porches, close to roads and even in parking lots! Last year in San Francisco, one mother had her pups under a parked car in a driveway right off Capp Street at 24th Street, which are busy and noisy streets. This year a coyote gave birth in one of the public restrooms of Golden Gate Park! It may come as a surprise that coyotes do not use dens year round. They use the dens to give birth to their pups and as a place to nurse their young — whelping. The pups move out soon after these beginnings, however, they retain use of the well hidden areas around the dens — these become their secret resting places. Most coyote families retain several of these areas for their use. The pups are moved regularly to escape flea buildup and as a safety measure. 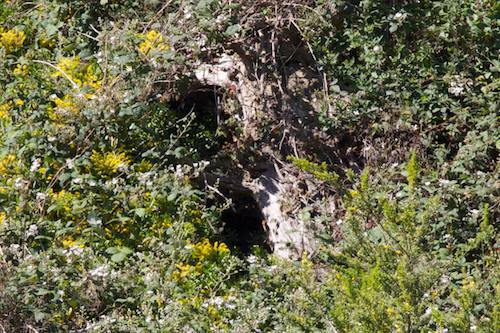 I think of a coyote den as being similar in usage to a bird’s nest: it is a temporary “nursery”. However, the nest, if it is still somewhat intact, may be fixed up the next year to be used again. This is how the coyote dens I’ve seen work. People are constantly asking me where the dens are, and I have to respond that, unless they are having pups, there are no dens: coyotes sleep out in the open and can sometimes be seen doing so. See my posting of July 15, 2010: Sleeping and Resting Right In The Open. The den is dug by both parents-to-be on sandy hillsides and steep creek banks, under logs or rocks, within underbrush and in open areas where the digging is easy. These are always areas chosen for protective concealment, but also, they are places that can be watched by a coyote parent from some distance, again for protective purposes. Not all coyote dens are made by coyotes themselves: coyotes sometimes dig out and enlarge holes dug by smaller burrowing animals, such as badger or fox dens. In suburban and urban areas coyotes may dig dens in golf courses or in other vacant lots, under sheds and under culverts and storm drains. Dens are usually three to six feet below the surface and can run from only a few feet to 50 feet into a hillside. The dug out tunnel leads to a large chamber, which often has a second or even more entrances that are better hidden than the digging entrance. Active dens are hard to find because of the various entrances — and because coyotes are very careful not to lead anyone there. Coyotes have not one, but several dens which they move between, not only to protect the pups from predators, but also to protect the pups from the fleas and other parasites which build up. A coyote will fiercely defend its den if it believes the pups are in danger, even charging full-grown grizzlies who came too close. This is why dog owners are warned to keep their dogs far away from coyotes during pupping season. Pups are born from March thru mid-May, and then are nursed for 4-6 weeks. But the end of nursing is not the end of “pupping”. I’ve seen mothers fiercely defend pups who are approaching two years of age when dogs go after them. It is best to respect coyotes and allow them the space they need to feel safe. Here is a wonderful link to a video of pups emerging from their den for the first time, produced by BBC Worldwide. It is called Coyote Cub Singing, and shows a very young coyote pup producing his first high-pitched howl!! Also, see more, slighlty older coyote pups emerging from their den.